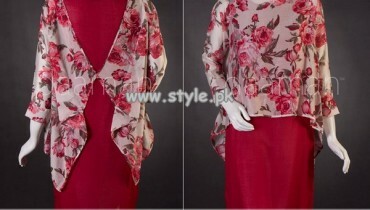 Tzarina released its semi-formal wear collection some time back. Exclusive and chic party wear dresses are included in Tzarina semi-formal wear collection 2013. 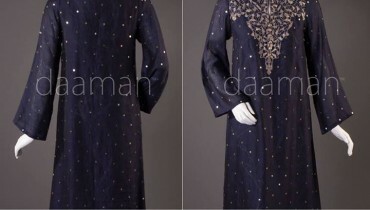 Gowns, kaftans as well as long shirts are the main features of the dresses in the collection. Luxurious fabrics like silks and chiffons have been used on the shirts. Thus, the dresses of Tzarina semi-formal wear collection 2013 look quite elegant. The cuts of many of the dresses are western but some of the dresses have traditional eastern cuts. Therefore, all those women looking for party wear dresses should consider Tzarina semi-formal wear collection 2013 for women. Tzarina is a brand founded in 2012. The word ‘Tzarina’ literally means ‘Empress’ and the dresses of the brand will definitely make you feel like it. Feminine and elegant dresses form each collection of Tzarina. They are meant for women who will not settle for anything less than spectacular. The stylish dresses are treated as more than just articles of clothing; the team treats each dress as a work of art and work hard to make each dress so beautiful that brings out the diva in a woman. The western wear collection of Tzarina is available at Topshop. Other than that, customers can get in touch with the team through email or phone. Tzarina semi-formal wear collection 2013 for women can be seen below. The photos from the collection’s shoot are given below. If you have any questions about the dresses in Tzarina semi-formal wear collection 2013, you should email or call the team. The email address and phone number with which you can contact the team of Tzarina are given on Facebook. So, you will have to visit the Tzarina facebook page if you are wanting to know more about the dresses of Tzarina.